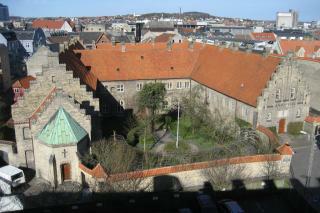 The Monastery of the Holy Ghost in Aalborg was built in 1431, but not established as a monastery until 1451. It functioned as a hospital and nursing home for the city's ill and poor inhabitants. After the Reformation in 1536, the monastery was converted into a hospital managed by the town council. From 1554-1847, part of the east wing was used as a Cathedral school. The monastery is Denmark's oldest social institution and still has homes for the elderly to this very day. Though the church was demolished in the 17th century, the rest of the monastery still stands - as one of the best preserved mediaeval monasteries in Denmark. It is also considered the best preserved monastery of the Order of the Holy Ghost north of the Alps. The Holy Ghost moved into Aalborg in 1431, when a local dignitary called Maren Hemmings established a House of the Holy Ghost" to care for the city's sick and poor. Most Danish towns had these kinds of social foundations run by the town council in the late Middle Ages. But in 1451 Aalborg's House of the Holy Ghost was the first to be transferred to the Order of the Holy Ghost – a hospital order that originated in the South of France. The monastery had both friars and nuns to help patients both spiritually and physically. The nuns and monks lived separate lives in different parts of the monastery, also looking after foundlings and orphans. In Aalborg, the elderly could go to the Holy Ghost to buy a nursing home place. "